Optimizing your golf swing can improve your performance and the enjoyment of the sport. 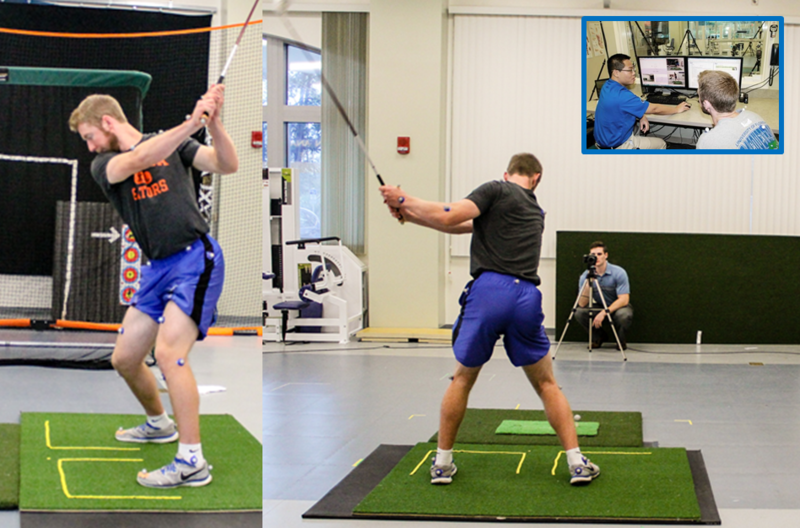 Participants can have the biomechanics of their swing analyzed. During the test, full body markers are placed on the upper and lower body to track the motion during a full golf club swing. The results are analyzed and used to enhance overall muscular fitness, reduce the possibility of golf related injuries and improve in game performance. Your data are compared to those of professional golfers. We also perform post-surgical joint replacement testing to help patients get back into the game! How efficiently am I striking the ball? Distance and Ball speed are directly related. A Smash Factor evaluation is a quick test that measures how fast you swing the club and with what efficiency you transfer the speed into the ball and is a ratio of the ball speed to the club head speed. PGA Tour players such as Patrick Cantlay, Nick Watney average 1.507 and Tiger Woods achieved 1.487 on Par 4 and Par 5 tee shots. What is yours? In addition to the Smash Factor evaluation, the Pathfinder Evaluation measures club head speed, ball speed, launch angle and other factors which determine how far and how straight you hit the ball.